On Friday, Attorney General Loretta Lynch spoke at the Congressional Black Caucus Foundation’s annual Legislative Conference, which was aired on C-SPAN. She spoke movingly about race in present-day America, comparing the current debate around police brutality and reform to the "early days of the civil rights movement." Here's the transcript of what she told the audience. Well. thank you all so much. Thank you so much for that warm welcome, thank you for your patience. I'm not usually running this late. But I understand that you have had some excellent presentations before me. I see a number of old friends, and hopefully new friends on this panel. Great voices all, in our common struggle. And so I think you have had excellent presentations and I'm just sorry that I had to miss so many of them. I am so looking forward to hearing the recap of this because there are so many important issues here. Dr. Gough, such a pleasure to meet you, your leadership at UCLA on the Center For Policing Equity is something that is not only vital, in terms of what we need today, it really is the key to a lot of the issues that we face. When I'm looking at the agenda for the entire CBC Foundation events, I see so many different panels on so many different issues, but they all come together in regards to the central issue of our community's relationships with law enforcement and with our government writ large. So many of the issues that you all are tackling all this week come back to that essential issue. And so I thank you so much for giving me a few minutes to talk to you this afternoon about what the Department of Justice is doing in this important area because I will tell you that I view it as one of my main priorities as Attorney General of the United States ... I want to thank him and his staff for their invitation to this event as well as for setting up this particular panel and of course the Congressman's lifetime of service to these issues. He has been in this fight for a long time. A long time. As have many of you. Not just here on the panel and on the podium next to me but out here in the audience. I see a lot of fighters. I see a lot of people who have walked a lot of lines, and walked across a lot of bridges, and so I thank you for that as well. Whether you have been in the struggle for years, or whether you are new to it and part of the new and exciting and dynamic young voices that we need to tell us the truth, I commend you and I am so so glad to hear from you. Your commitment is important, your ideas are important, your energy and your passion. And now is the time that we have to all come together around these important issues. Because while we have made just extraordinary progress since the CBC was founded over 40 years ago, it is clear that we have so much more work to do. In the recent weeks and months we've seen these reminders, you know there's not just the overall philosophy that we always say "there's more work to do, we have to keep marching." We've seen it. We've seen it played out in a very, very stark and very painful reality captured for the world to see. Tragedies that make it clear that this fight for our common welfare goes on. And I will tell you that what hurts me so much in my current role, is that we have seen the mistrust between our law enforcement officers and our communities also deepen at a time when, not that it hasn't always been the case, but at a time when our communities need, perhaps more than at any other time, the protection and the resources that law enforcement is committed and sworn to bring to bear. It has always been my view that the essential role, not just of government, but of law enforcement in particular is the protection of people who don't have anyone else to call on. You know those times in the middle of the night when people are cold and afraid and they know that someone is out there who means them harm, we have to have someone on whom to call. And we have to be able to trust and rely upon those individuals to come when we call and to also look out for us when they do arrive. Now this is an issue that I know you're talking about today, not just on this panel but so many others, but on this panel in particular you've got the voices to do it. You've got the experience and you've got the people who also provide you the perspective of what it feels like to be left out of that dynamic of protection; to be left out of that umbrella and that circle of guardianship that every American is entitled to. And that is such an important voice today. Now it's also not a new issue, although it's an issue that's very deep and very personal for me. As some of you may know, I'm fortunate enough to have my father here with me this week. But this issue is generations old and when I was a young girl I remember, the things I remember my father telling me about, you know you all talk about your grandparents and your aunts and your uncle, and the family lore that's what makes you who you are. You know that's how you know what the Lynches are like and you know what the Harrises are like, and they're both stubborn just so you know. But I remember my father telling me about his father, about my grandfather. A minister, third grade education, no money, eight children, dirt poor, living in rural North Carolina in the 1930s when my father was born. And even with all those things stacked against him, built his own church beside his house, called in Lynch's chapel. That's what you can do when you build a church yourself. And one of the things that my father remembers is that there were times when he was a young boy in the '30s, when people in the community, black people in the community were in trouble. As my grandfather used to say, "Caught up in the clutches of the law," and didn't have anywhere to go. And they would come to my grandfather and he would actually help hide them until they could leave the community. And sometimes the sheriff would come by the house and ask my grandfather, you know, "Gus, have you seen so-and-so?" My grandfather would say "Well, not lately." So-and-so is hiding in the closet or hiding under the floorboards because in those days, 1930s North Carolina, there was no justice in the dark of night on a rural road. No Miranda warnings, no procedural protections, none of the things that we take for granted today. And so despite what had happened with these individuals, my grandfather knew that sometimes in order to preserve the fight for justice into the future, you had to take action in the moment. You had to take action in the moment. Now of course, things are much better now, and we all get reminded of that whenever we bring up these issues, you notice that when you talk about these issues, whether they are of race in general or police issues in particular, when you talk about the current pain that the minority community is feeling and it is, we are feeling it very, very deeply, people say, "Well you know things are actually much better now." And they are. They are. You know, in addition for giving you my apologies for being late today, I can tell you that I was late today because I had a meeting with the president that ran over. I would never have been able to say that even five years ago. The fact that my grandfather who fought so hard for justice in his own way would never have conceived. That his granddaughter, the little girl he used to take out in the fields and you know, show what tobacco looked like, you know would actually be sitting in a meeting with the president of the United States. We have come so far, but we still have so far to go and these issues of fundamental fairness and the relationship that the minority community has with government writ large, and with those of us in law enforcement in particular are still with us. They are still important today. And we all understand on a personal level the frustration that comes up when we are treated unfairly because of race. But this is really about more than just that. This is really about being treated unfairly because of race by those who are sworn to protect you. By those who wear the uniform of protection. This is really a deeper issue than just the individual discrimination many of us have seen in whether or not we didn't get the job, or get an opportunity or someone didn't speak to us. We are talking about the pain that comes up when these deeply rooted injustices get shrugged off, and they get ignored. Now we are in a different time and things are much better, even if they may not seem that way. Even if this seems like a very painful time because we are seeing these issues so much more clearly, I have to tell you that this takes me back to the early days of the civil rights movement. And you all remember those days when people were marching and protesting and talking about conditions. You couldn't vote, couldn't get a job, couldn't sit into a store and just have a break and have a cup of coffee. And no one wanted to believe that that was the case until the advent of television. Remember the televise marches and the protests, and when the world saw what was happening, that police dogs were put on little children, that fire hoses were used against young men and women, that galvanized the conscience of the world and gave the movement a momentum to make changes. To give us a Civil Rights Act, to give us a Voting Rights Act, to give us desegregation, to help us craft those strategies that our lawyers use before the Supreme Court. And now we are in a similar moment, when so many of the images that we see are so painful. But they are being used to show the world what people in the minority community have known for years about the different levels of interaction and the different levels of both respect and participation in the system that African-Americans have and that African-Americans feel. And as painful as it is to watch someone suffering or possibly even dying, the result has been an opening of the discussion in ways that we have not had in significant years. And so the onus is on us to seize this moment. The onus is on us to continue this discussion, to continue this debate. Because now the world knows what we always knew. That people in Ferguson were being taxed for walking down the street and being the wrong color. The world knows what we always knew that young men of color's interactions with the police are fundamentally different than other children's. And that as parents, and as siblings, and as family members that we have a responsibility to point this out and talk about it as well as educate our children. But we also have to acknowledge more than just the actions, because there's something that goes on as well, something that's deeper when we have these situations. We have to acknowledge the anger and the despair, the feelings that develop. You know people they always talk about wanting us to handle things in a certain way, and that's true and and this country was built on peaceful protest. It is a fundamental right of ours and it can achieve a great deal of change. But we also have to acknowledge the anger and the despair that develops when these concerns that we now see on tape are still pushed aside by so many people as if they don't exist. You have to acknowledge the kind of pain that develops. You have to acknowledge that feeling... and you know that people say "Well I don't think it was that bad." "Well I don't think they meant it that way." Or even, "That just didn't happen." You know, it just didn't even happen. And so when that happens to people, to a people, to our people time and time again, you have to have within our community a sense of disconnection and despair that is as dangerous as any bullet or any billy club. It absolutely is. But of course I'm not the first to note that, and honestly I would refer you back to that work of art by Ralph Ellison, Invisible Man. Invisible Man. And you will see all of that there. And you'll see the [inaudible] as well. And of course the reason why we have to face this and deal with these issues is of course because as always, as with the movement 50 years ago and the issues now, it's our children who are bearing the brunt of these issues. It's our children who are growing up without that sense of connection, without the sense of protection and security that they are entitled to have. And that we want them to have. Now one of the things I am doing is I'm doing a six-city community policing tour. I'm going to jurisdictions that have had very very troubled and very challenging relationships between the police and the community five or 10 years ago. Either a lawsuit, a shooting incident, a consent decree, where the Department of Justice has had to come in and concert a certain amount of either actual persuasion or actual litigation in order to manage unconstitutional policing practices. But there are jurisdictions that have turned that corner, and I'm talking to people about how and why that is the case. And of course things are still not perfect, there are still people who feel on the fringes of what we are trying to achieve for them, and those are the voices that I want to hear the most, because those are the voices I have to address. And when I was in Pittsburgh I was talking to a group of young people, high school students, because they will tell you what is happening in their daily lives and they'll tell you what they see, and they'll tell you, more importantly, how it makes them feel. And I was talking with a young man who told me he was afraid to walk in this particular Pittsburgh neighborhood, he described it as a fairly rough neighborhood. And so he felt threatened by forces around him who had other agendas, who were trying to draw him into gang life or try to draw him into violence or possibly put him in the way of being accidentally caught in crossfire. But what he told me that was the most painful thing was that it wasn't just the other residents who frightened him who clearly were not on the past that he was on, he was excelling in school and moving ahead with a bright future, he was also afraid to call the police when he felt that way. Because he didn't know if he could tell the difference between him and the people who were trying to do him harm. And what I say is, what we have to acknowledge is is that no one should feel that way. Not in America. Not today. Not our children. And for those of us who've spent a career in law enforcement and the people I know on this panel and the people in this room, anyone in law enforcement who hears that should say "I do not want that feeling in a child of mine." Because they're all our children. They all have to be. And this has to be the starting point for our work. Do our children feel safe? And if they do not, what are we doing to change that dynamic for them? What are we doing, not only to make them safe, but to make them feel that there are people and forces that look out for them, that are supporting them, and that are coming into the community to protect them. 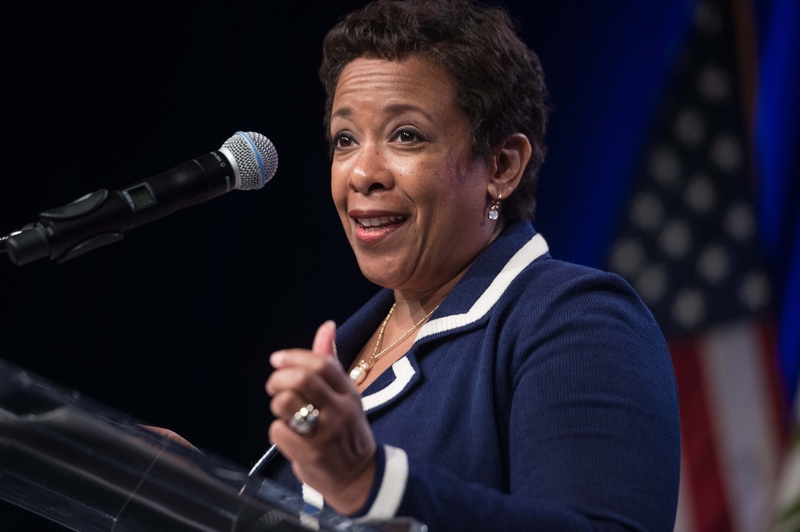 Lynch went on to describe additional work that she and the Justice Department are doing to hear important voices in this conversation, and talk to communities who have found "working solutions" to some of the problems black communities are facing in relationships with local law enforcement. Lynch also discussed over-incarceration and alternatives to traditional incarceration. She ended her speech by stating that all Americans have a right to feel safe and protected, and to a fair justice system under which they can thrive.